This section covers modifying administrator, server, security and e-mail settings. 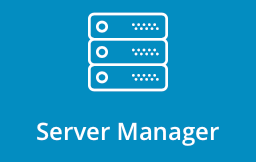 To access Administrator Settings, sign into the control panel and then click on the "Server Manager" icon, followed by the "Administrator Settings" link. Check the first box if you want DirectAdmin to notify all Admins when a service goes down. This notification will be sent through the message system. We suggest that Admins set an e-mail address in the message system as well, so that notifications will reach you even when you aren't signed into the control panel. The overselling box allows Resellers to sell more features than they are allowed. Note that this would not allow reseller to use more bandwidth or disk space than he's actually allowed to, however it lets allocate more space limits to it's customers. You can choose not to suspend a Reseller and their users after Reseller goes over their Bandwidth limit. Allowing Reseller to Backup/Restore their Users will let Reseller to be prepared in emergency situation even if User itself didn't had backup. The automatic updater only applies if we send out a forced update. Not having this checkbox enabled prevents the updates from happening without your knowledge. The usual method to update is still to go to your Licenses/Updates page and click on the "Update DirectAdmin" link. 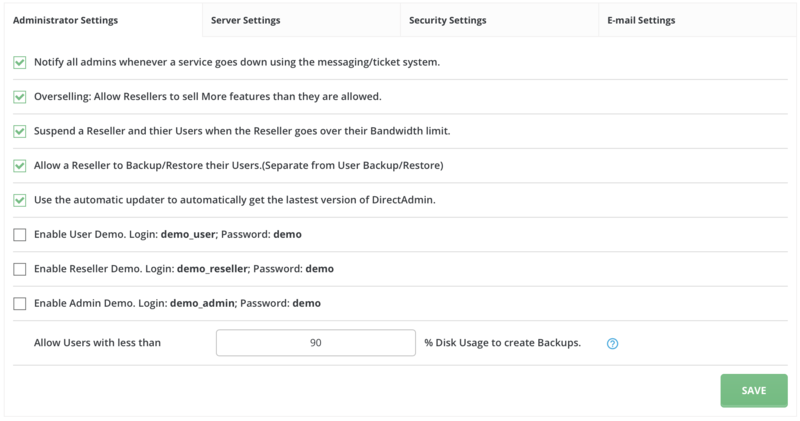 The last three checkboxes are used to enable and disable the DirectAdmin demo. The demo is useful for showing others how the control panel functions, without giving them access to make any changes. For example, you may want to enable the User Demo so that your Resellers have a way of demonstrating the control panel to their prospective customers. "Allow Users with less than ..." section is used to limit when a User is allow to create a Site-Backup. If the account already has 60% usage, on the assumption that a backup is compressed enough to fill the last 40% of the account, then this is the limit that will prevent a User from creating a backup that would put him over his limit. A user with 65% disk usage would not be able to create a backup. Alternatively, you can use 0 to turn off user backups completely, or set it to 100 to allow them all the time under any situation. The Server's Name should be based on the primary domain of the server. E.g. server5.hostingcompany.com, server.garys-site.com, etc. This name must resolve. It must not match any domain on your server that you plan on using. For example, this value should not be site-helper.com, but server.site-helper.com is ok. The NS1/NS2 fields define the default (or primary) nameservers for the server. These generally take the form of ns1/ns2.server-name.com. The Timeout refers to the amount of time given for a command to execute (e.g. sign-in after username/password have been submitted, loading the statistics page, etc). The session Timeout refers to the amount of time given to take an action before DirectAdmin will automatically logout. The Max File Upload Size refers to the maximum file size that can be uploaded through the control panel. The default is set at 10 megabytes, in bytes. Document root to Demo Skin refers to the folder where skin files are for demo users. Warn Admin's at % of partition usage will send an e-mail to admin when desired amount of partition will be full. You can disable this feature by entering 0 value. You will also have to choose how often disk usage is being checked. Enable Automatic Lost Password Recovery will automatically send you an e-mail with password reset link if your account gets blocked. You may also choose how many times user can fail to enter credentials after their IP becomes blacklisted. You can choose how lond time passes before login count resets. Login count reset is required because you may naturally enter wrong credentials by mistake from time to time and then become unexpectedly blacklisted at some point of time. Parse Service logs for brute force attacks box will send you an e-mail notification every time brute-force attack was registered and blocked. You may also choose how many login failures has to be before Admin will be notified. Also there is reset of failed attempts after desired amount of time. You may want to clear old failed login logs after some time, because old logs tends to eat your disk space really quick. WordPress attacks scans for typical attacks targeted for WordPress Panel, so you may want to disable this feature if your Users do not use WordPress. Difficult Password Enforement will force users to use special characters, numbers, lower-uppercase letters in their passwords. Checking domain owner for Subdomain creation will let only the domain owner to create subdomains of that domain. You may set daily e-mail limit per DirectAdmin User. Note that User may have more than one e-mail address, so you can also set limit per email. You may also let users to set their own limit per e-mail. However, it would be advisable that max limit would not exceed your set limits. You may want to use Realtime Blackhole List blocking. RBL blocking will automatically block IP's of spam e-mail senders. Also, you may want to purge old Spambox/ Trash data every time of period. From there you can access configuration files, by simply clicking on desired .conf file button. You will see configuration files. In order to change them, click on the "Customize" button. You can also want to enable/disable Open Basedir in some of your client(s) site(s). In order to do so, click on the "PHP Configuration" in "Server Manager". You will see a table of all existing domains and Open BaseDir status next to them. In order to change Open BaseDir status. select desired domains and click on "Enable/Disable Open BaseDir" button. From there you can see all users cron settings. You can install new plugins, delete or de-activate existing ones. To modify existing plugin click on the "+" button in the right corner of the table next to desired plugin name. You can add new plugin by clicking "Add" button. Enter the URL address of located plug-in file, or upload plugin from your computer. Make sure "Install after upload" box is active, then enter your password and click "Install" button.